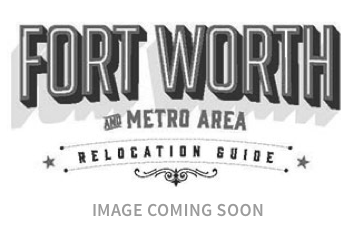 East Fort Worth is the perfect spot to live if you’re commuting to Arlington or Dallas and still want to reside in the city. Although East Fort Worth doesn’t have the bustling entertainment district that’s so popular in other parts of the city, it does have lower-priced homes in historic neighborhoods. Meadowbrook is one of those. Less than 15 minutes from downtown, this neighborhood is full of mid-century modern homes with lots of potential for revitalization. Many young families who have been priced out of the Near Southside are heading east for more room, funky architecture, and an affordable monthly payment. The homes in West Meadowbrook have all the charm, style, and history of Fairmount, but for half the price. Houses are a real deal—like a darling (and recently renovated) 1920s Tudor for just $80 per square foot. The White Lake Hills subdivision, located on the north side of I-30 and Oakland Boulevard, is a diamond in the rough. It maintains low crime and an active neighborhood association. During the 1960s, the neighborhood was filled with famous artists and architects who lived there and designed some of the 550 homes that make up the neighborhood. Today, most of those homes are selling for around $100 a square foot, and some of the best pieces of land overlook the Fort Worth skyline. Gateway Park is well on its way to becoming one of the largest urban-programmed parks in North Texas. At just over 1,000 acres, the park will feature spaces dedicated to various outdoor activities including an outdoor amphitheater, rowing center, and the Fort Woof Dog Park to name a few. Minutes from this neighborhood are two excellent private schools: East Fort Worth Montessori Academy and Nolan Catholic High School. Fort Worth ISD’s new $41 million STEM Academy and Performing Arts Center, located in Eastside, will open fall 2018.